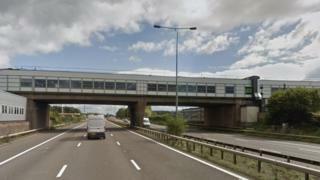 Three people have been arrested after a number of people got out of the back of a lorry at services on the M6. Police used a helicopter to search for five people after they were called to reports of a "suspicious lorry" at Keele at about 11:35 GMT. The Staffordshire force said there was an immediate search of the area, but no-one else had been detained. The Home Office said three men, who presented themselves as being Iranian and Iraqi, were referred to it. Their cases would be dealt with in line with the immigration rules, it added. The Home Office said immigration officers were contacted by police, after officers attended an incident at the services between junctions 15 and 16 near to Newcastle-under-Lyme and Stoke-on-Trent. West Midlands Ambulance Service said three people who exited from the back of a lorry had been assessed by staff, but did not require hospital treatment.